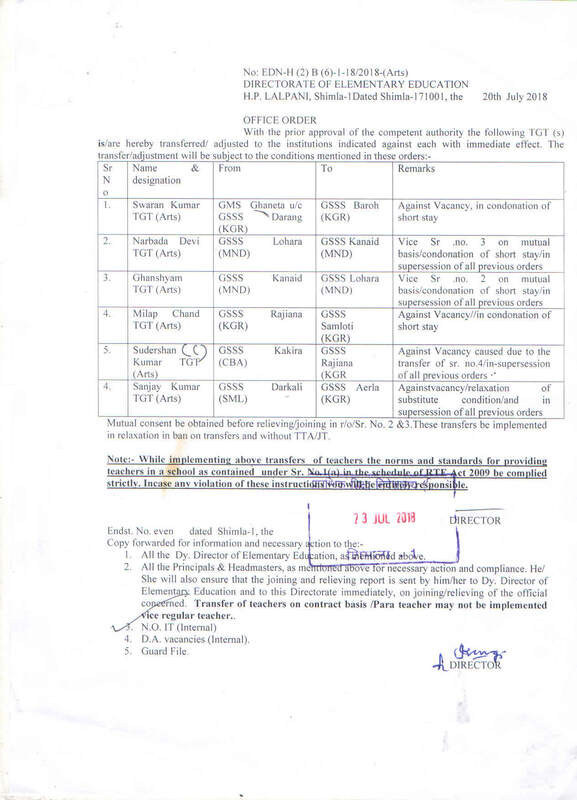 Regularization of contract Appointees in the Government Departments Instructions thereof. 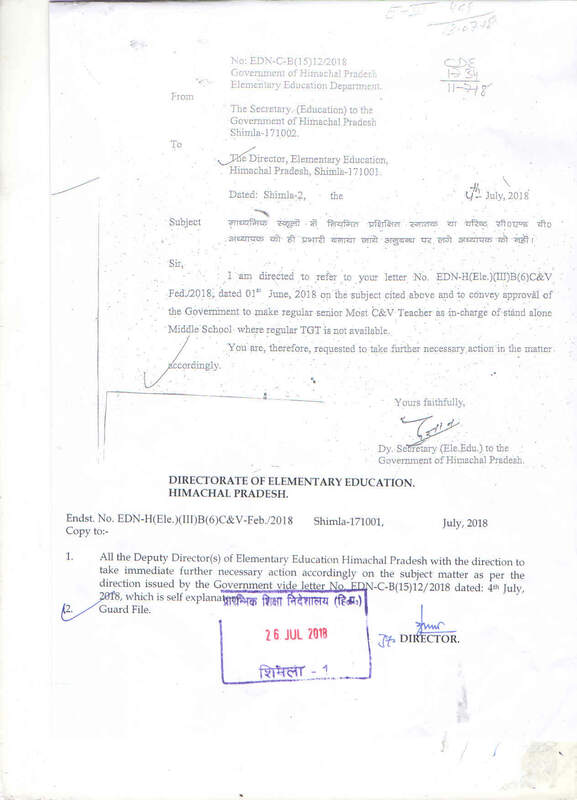 Regarding enhancement in emoluments of Para & PAT at par with the regular teachers. 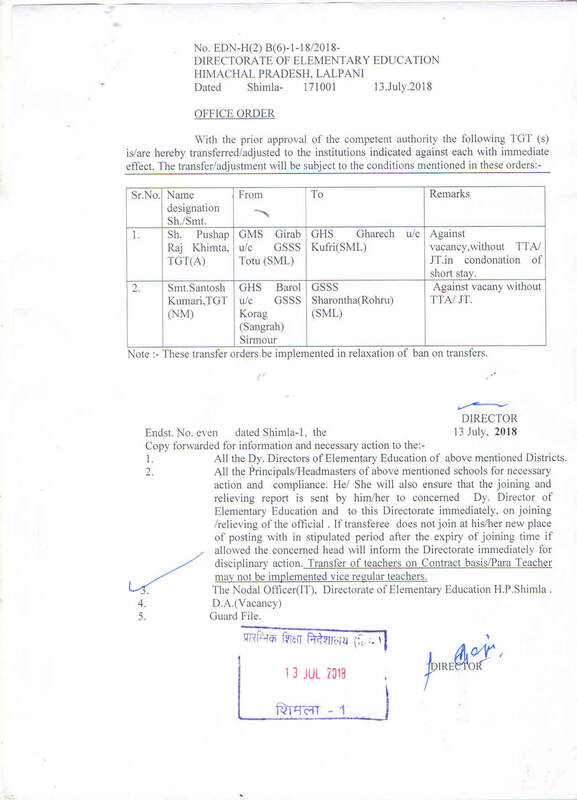 Notificaton regarding enhanced honorarium in r/o PTA Teachers. Proforma for supplementary textbook for summer-clossing schools. 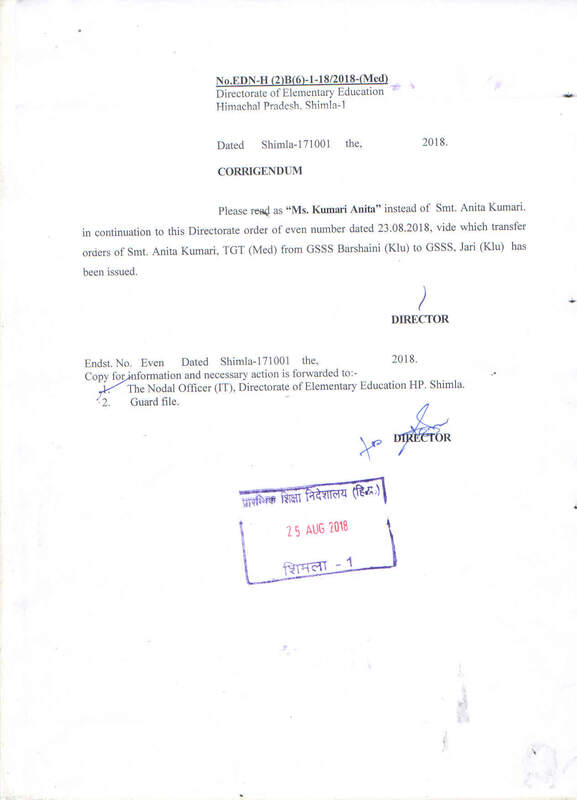 Cancellation of Appointment order in r/o Smt/Km Dharma Devi D/o Sh. Hem Chand W/o Pawan Kumar Village Bharoun P.O Dudar Tehsil Sadar Distt. Mandi TGT Medical under Gen-WEXM category. 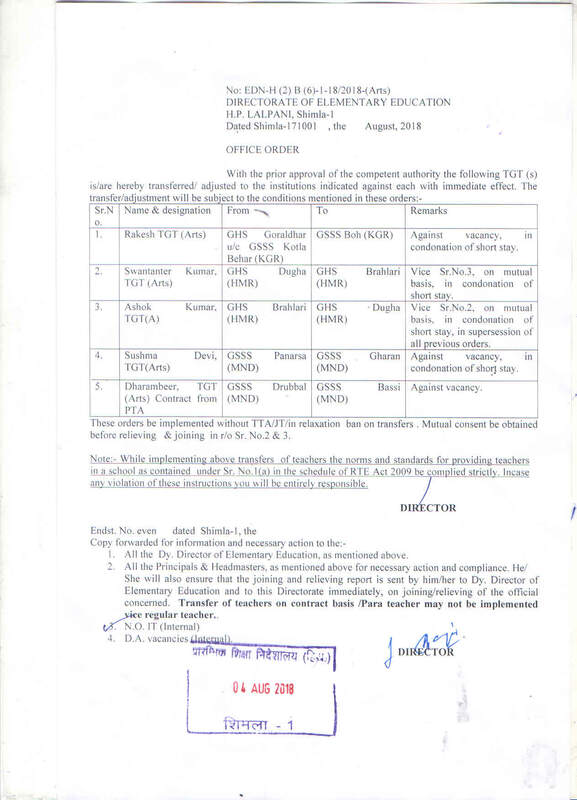 Regarding inclusion the names in TGT promotion panel amongst TET pass in-service C&V teachers Possessing B.A./B.Com./B.Sc.(NM/Med.) & B.Ed. degree as per R&P Rules for promotion as TGT in the year 2019. 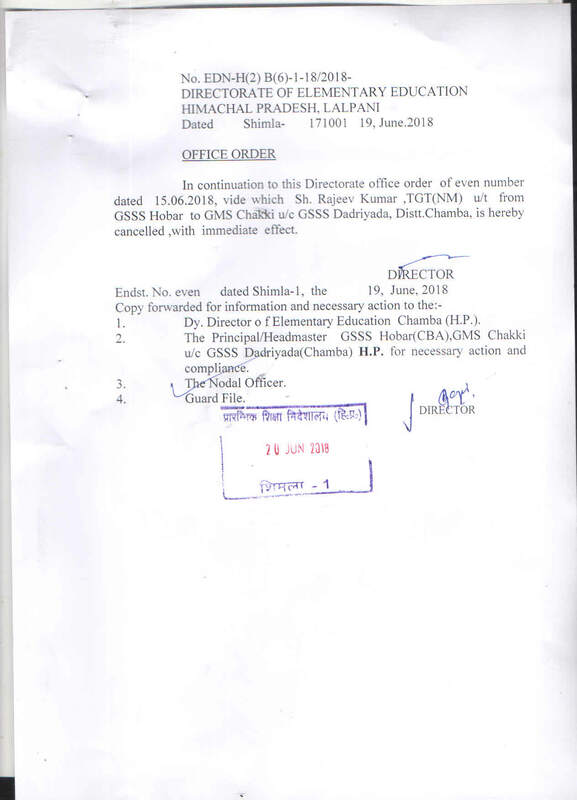 Appointment order of Clerk on Contract Basis in r/o Vishav Bharti D/o Late Shri Rakesh Kumar dated 08.03.2019. Appointment order of TGT(Medical) dated 07.03.2019 on Batch-wise basis. 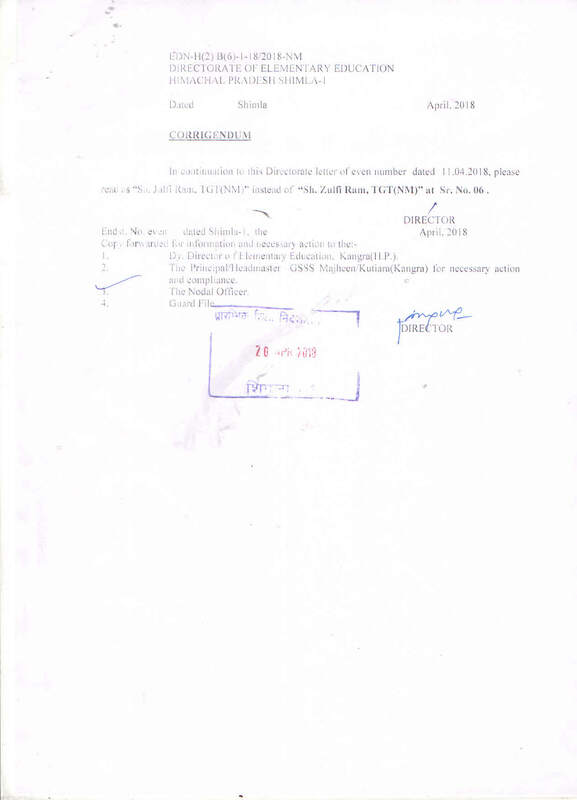 Appointment order of TGT(Medical) dated 06.03.2019 on Batch-wise basis. 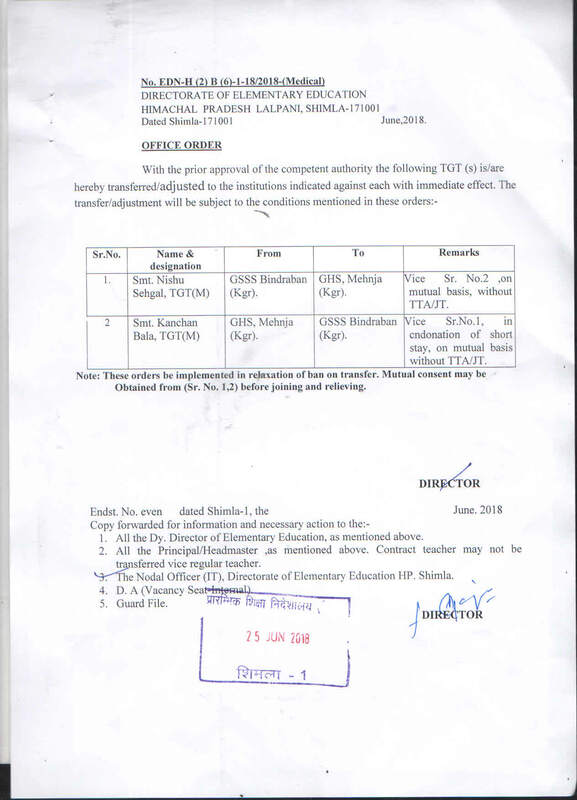 Appointment order of TGT(NM) dated 06.03.2019 on Batch-wise basis. Appointment order of TGTs(Arts/Med./NM) under WEXM Category on batchwise basis counceling held in the Month of April to June 2018. 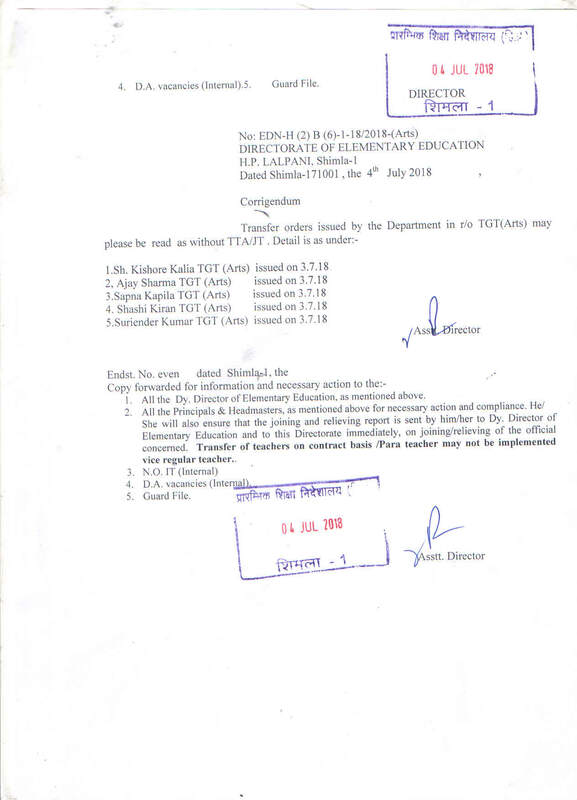 Regarding counseling for the recruitment of Trained Graduate Teachers (Arts, Non-Medical, Medical) purely on contract basis amongst TET qualifiers from the HP. 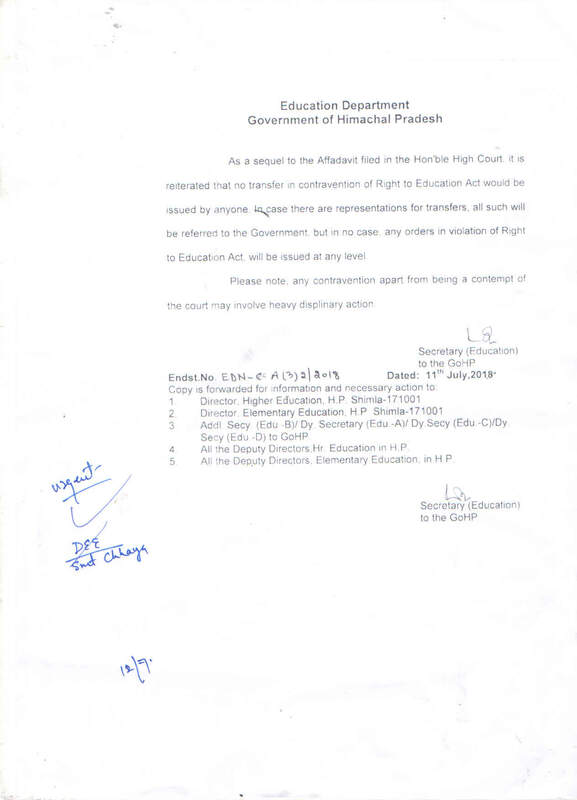 Board of School Education Dharamshala or HPSSSB Hamirpur. Schemes for maintenance, review and custody of list of public servant of gazetted status of doubtful integrity. 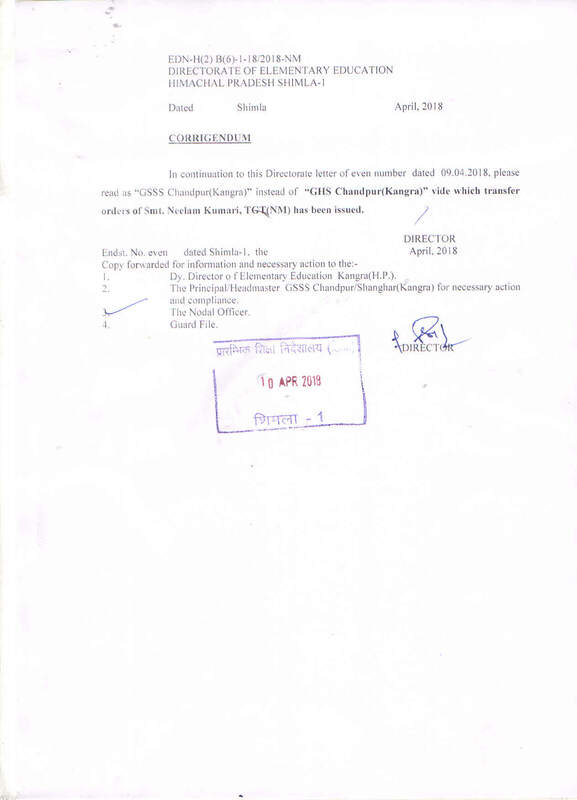 Office order for the post of Clerk on Daily wage basis on compassionate grounds. Office order for the post of Clerk on Contract basis on compassionate grounds. Proforma for supplementary textbook demand for winter closing school 2019-20. Verification of certificates for the post of TGTs against Sports quota purely on contractual basis. Requisition to be used for applicants from Employment Exchange for recruitment of TGT(Non-Medical) and TGT(Medical) in the Education Department against vacancies from TET qualifiers purely on contract basis. Proforma for promotion to TGT(NM/Med) from JBT Cadre against 15% quota. Proforma for promotion to TGT(Arts) from JBT cadre against 15% quota. Corrigendum Directorate letter of even number date 30.11.2018 Sh. Anil Kumar, TGT(NM). Corrigendum to read Gopal Dass instead of Gopal Singh. Corrigendum please read file no. 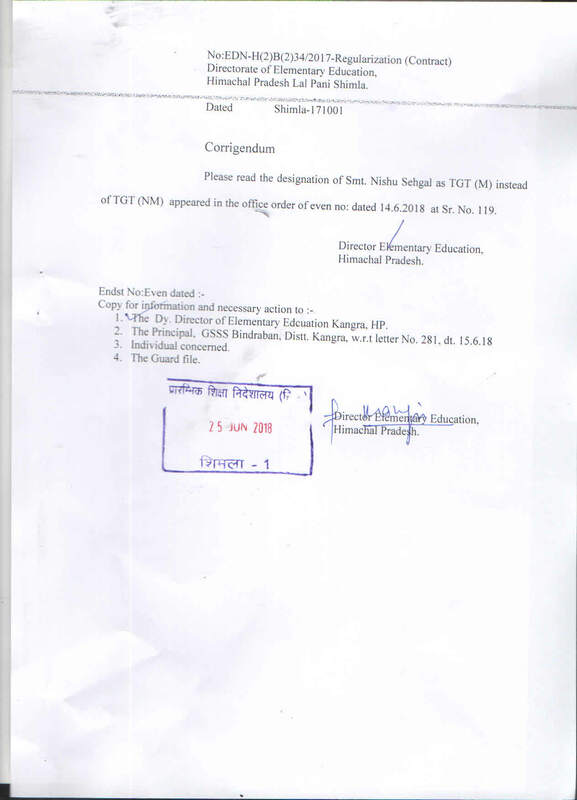 "Edn-H (2)B(6)-1-18/2018(Med)" in continuation to this Directorate order of even number dated 10.12.2018, vide which transfer order of Smt. Veena Sohal TGT(Med). 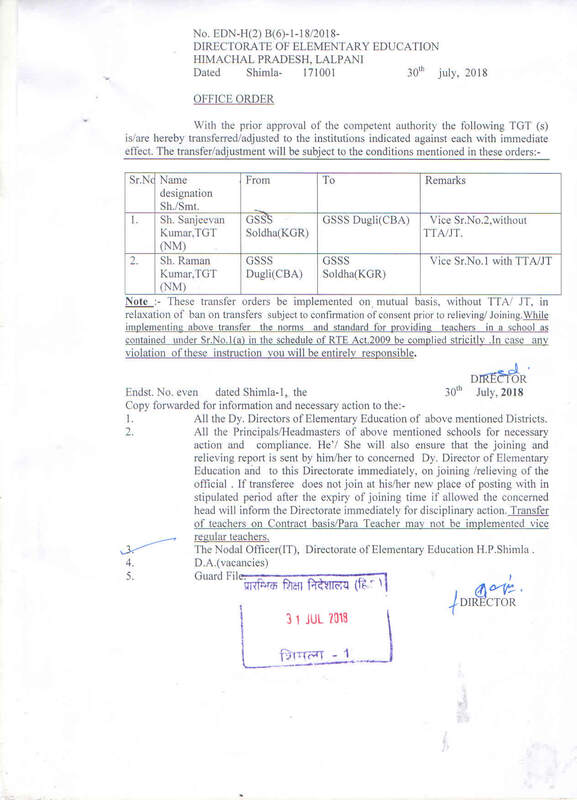 Schedule of six month PDPET Examination for the in service teachers of the state of Himachal Pradesh. Regarding nineteen girl students teasing by teacher. Corrigendum to read Sh. Naresh Kumar, TGT(NM) u/t from Block Panchrukhi (KGR) to GSSS Cheel Bunglow (CBA) dated 26.11.2018. Corrigendum to read Smt. Sonia Sood, TGT(Med) instead of Smt. Sonia Joshi, TGT (Med) dated 26.11.2018. Corrigendum to read "Distt. Hamirpur "instead of Distt. Kangra against the name of Sh. Ravinder Singh TGT (Arts) dated 26.11.2018. 4th session of 13th vidhan sabha (Winter) commencing w.e.f. 10 December,2018 to 15th December 2018. 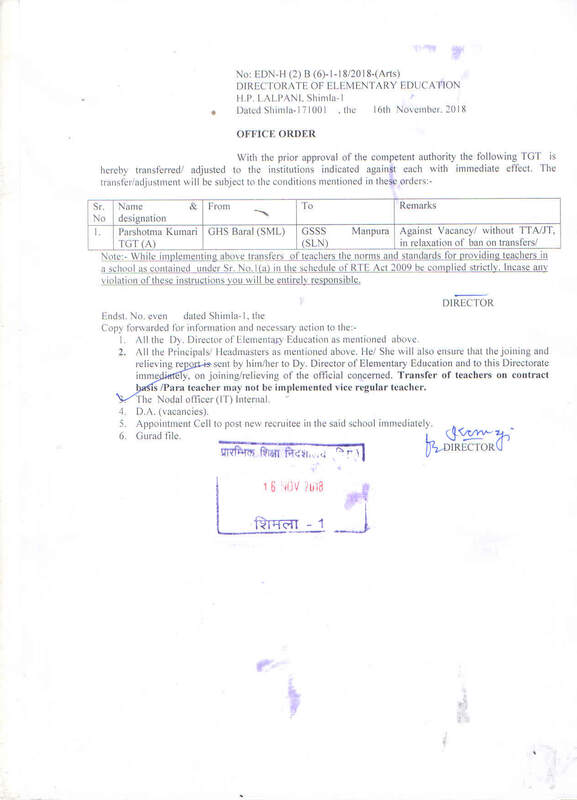 Office order of appointment of Miss Ayshi Bahri, deputy directorate of elementary education solan, district solan, HP on contract basis. Right of Children to Free and Compulsory Education Act 2009. Corrigendum: to read "regular" instead of contract in r/o Smt. Rekha Kumari TGT(A) , transferred from GSSS Koti Bonch (SRM) to GSSS Ronhat(SRM). Corrigendum : In-continuation of this O/o dated 17.10.2018 wherein transfer orders dated 26.10.2018. Run for unity on 31st October,2018. Organization of painting competition by SJVN to the school Children at school state and National level. Smt. 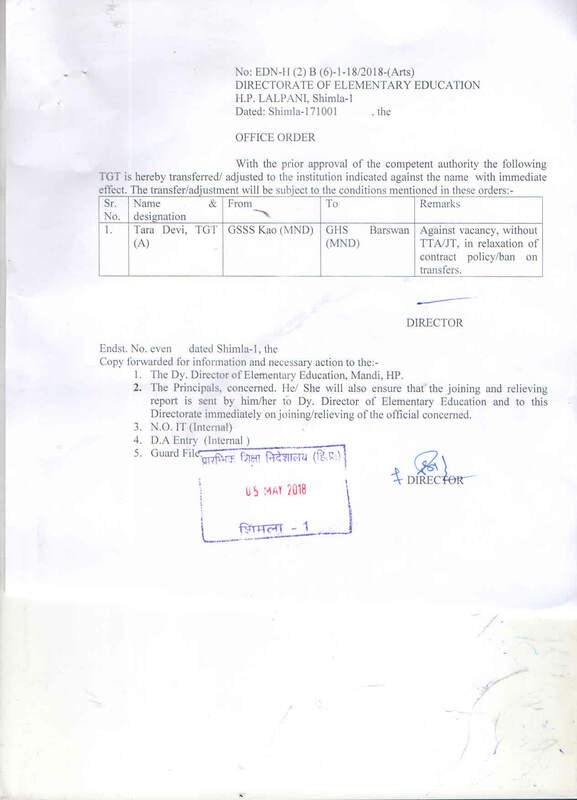 Babita Kumari TGT(NM) is hereby allowed to join duty back at her previous place of posting i.e GSSS Reckong peo. Notification regarding increasing remuneration of SMC teachers @ 20% as per announcement in budget speech for the year 2018-19. 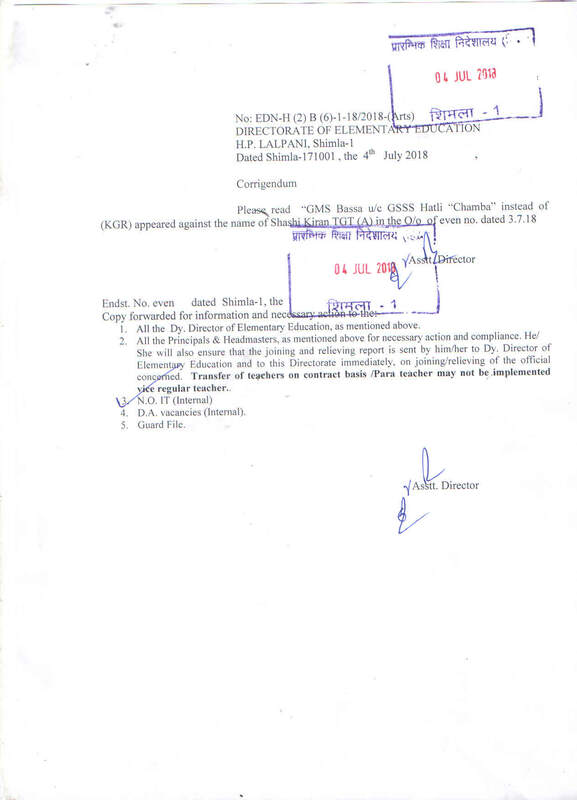 Corrigendum : Name of the school mentioned as GSSS Chhandoh may be read as GHS Chhandoh and name of the incumbent may also be read as Mohinder Singh, instead of Mahender Patial. Corrigendum : Please read as GHS Bhattu Samula (Kgr) instead of GSSS Bhattu Samula (Kgr). Corrigendum : Transfer order of Smt. Anjana Devi,TGT(A) from GMS Sunog u/c GSSS Banore (SRM) to GMS Bherewala u/c GHS Rampurghat (SMR). Corrigendum to read as Sh. 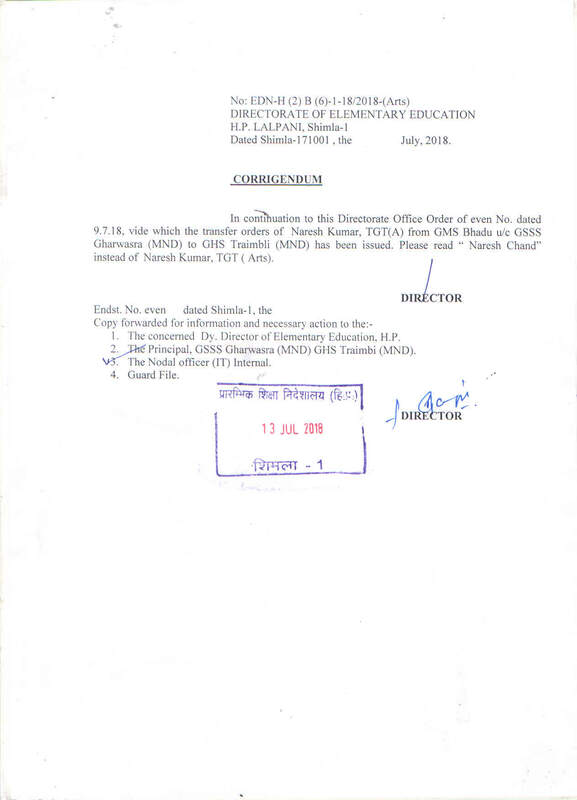 Anil Kumar TGT(NM) instead of Sh. 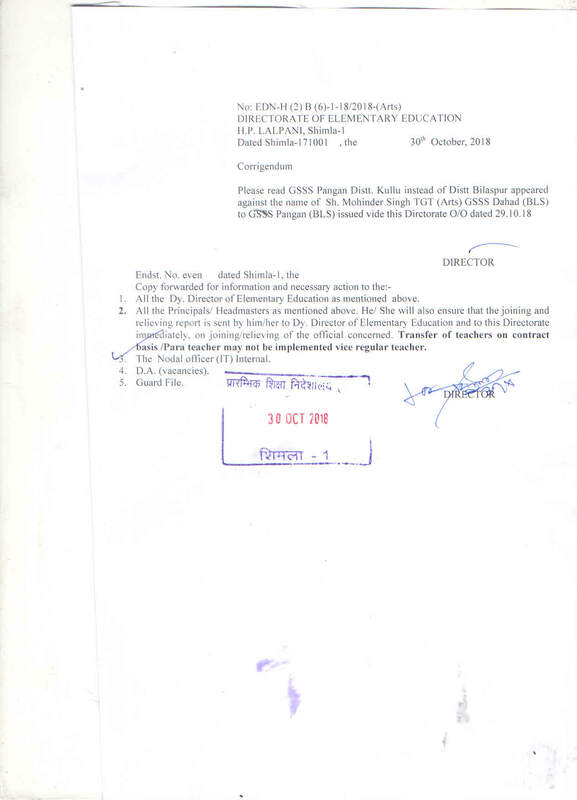 Anil Lumal TGT(NM), and the name of school is GMS Bari-Baghot instead of GMS Baghot, Distt. Bilaspur. Relieving/Joining/Forgo information of JBTs promoted as TGT(Arts/NM) on dated 03.07.2018. 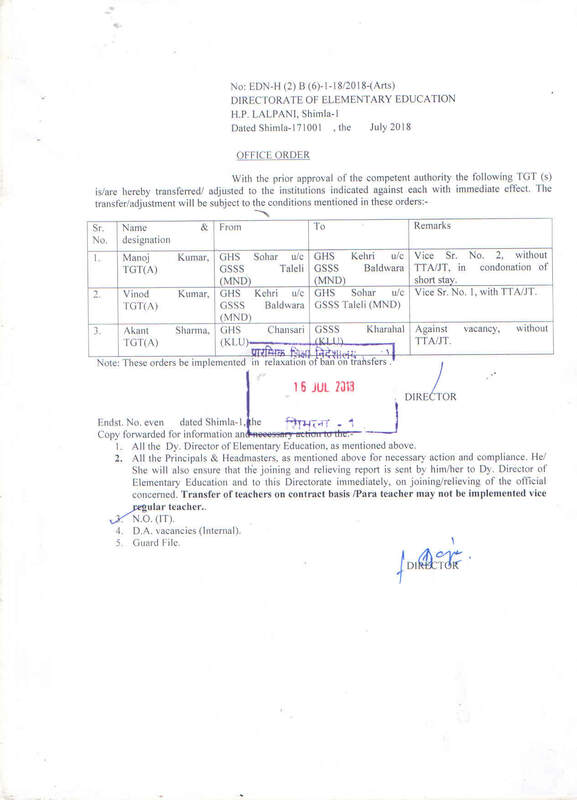 Modification Order of TGT (Med/ Arts) of WEXM-TGTs-Batchwise dated 25.08.2018 and14.09.2018. 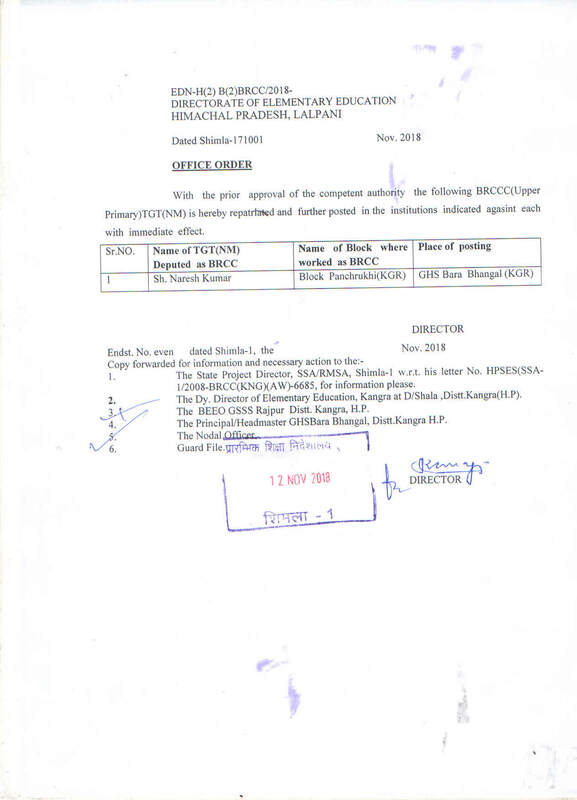 Office Order regarding the Modification order of TGT (Art/Med) of WEXM-TGTs / Batchwise dated 14Office Order regarding the Modification order of TGT (Art/Med) of WEXM-TGTs / Batchwise dated 22.9.2018. 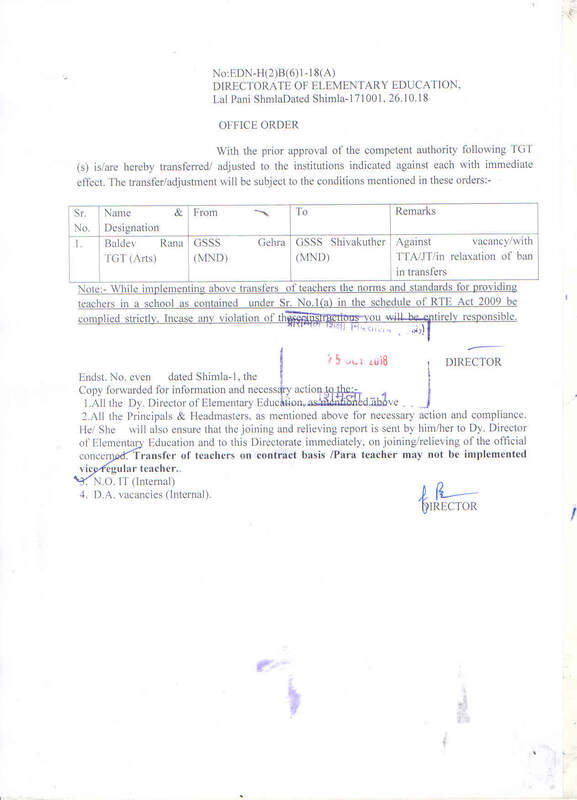 Office Order: Transfer/Substitute of Smt. Abantika Chaudhary TGT(NM) and Smt. Anu Sharma. Corrigendum to read GSSS Naghiar,Distt. Bilaspur in respect of Smt. Rekha Kumari,dated 29.08.2018. Regarding Personal hearing in view of the court case. Regarding the Effective Action Against Drug Abuse. Regarding Office Order Of Sh. 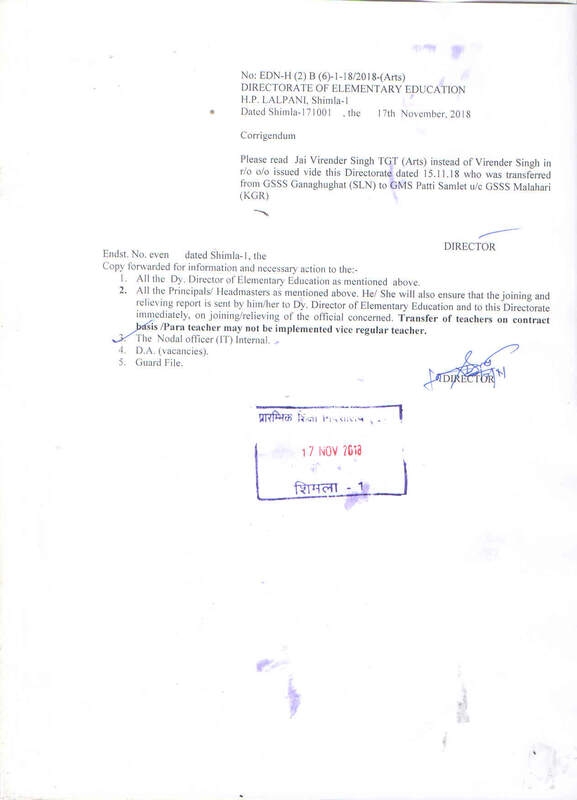 Hitesh Azad, Joint Director (Admin), Directorate Of Elem Edu, act as Liason Officer For Vidhan Sabha pertaining to Elementary Education during 3rd Session (Monsoon). Corrigendum in respect of Smt. Sarita Devi, LT from GSSS Sunhani, District Bilaspur. Corrigendum to read GHS Gahar u/c GSSS Dadhol , Distt. Bilaspur and Smt. Jagtamba Devi. Requisition for the post of TGT(Medical) purely on contract basis. 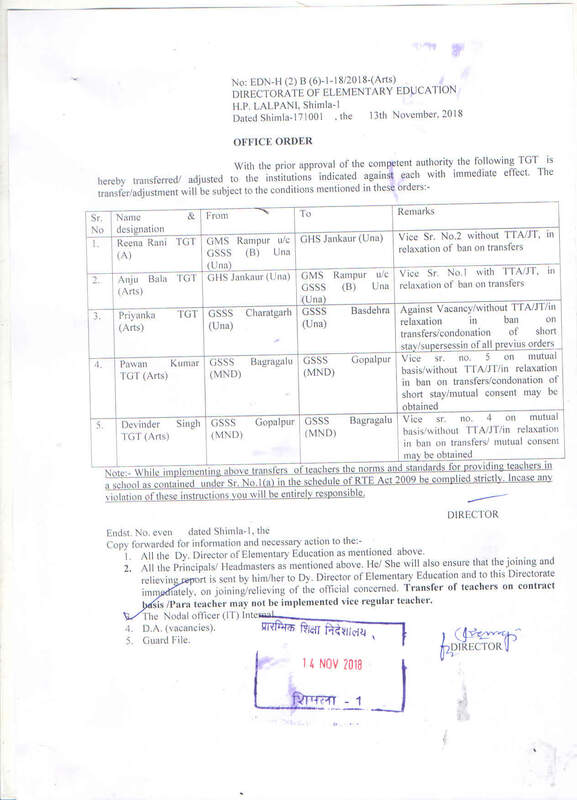 Requisition to be used for applicants from Employment Exchanges for recruitment of TGT(A), TGT(NM) and TGT(M) in the Education Department against vacnacies from TET qualifiers purely on contract basis. 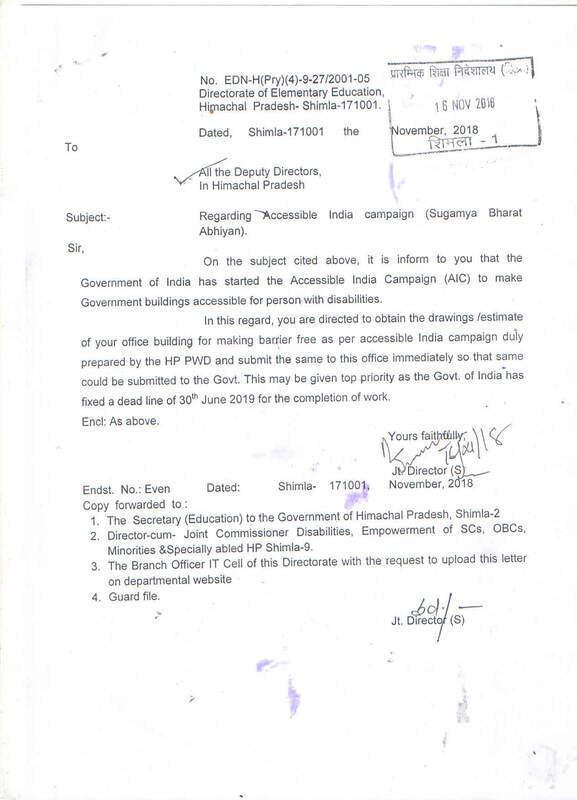 Appeal by Hon’ble Education Minister, Government of Himachal Pradesh. Corrigendum to read the designation of Smt. Nishu Sehgal as TGT(M), GSSS Bindraban, District Kangra. Corrigendum in respect of Ramesh Sharma, TGT(NM) ,GMS Chaily u/c GSSS Summerhill(SML) ,District Shimla, Dated 18.06.2018. The adjustment order of Smt. 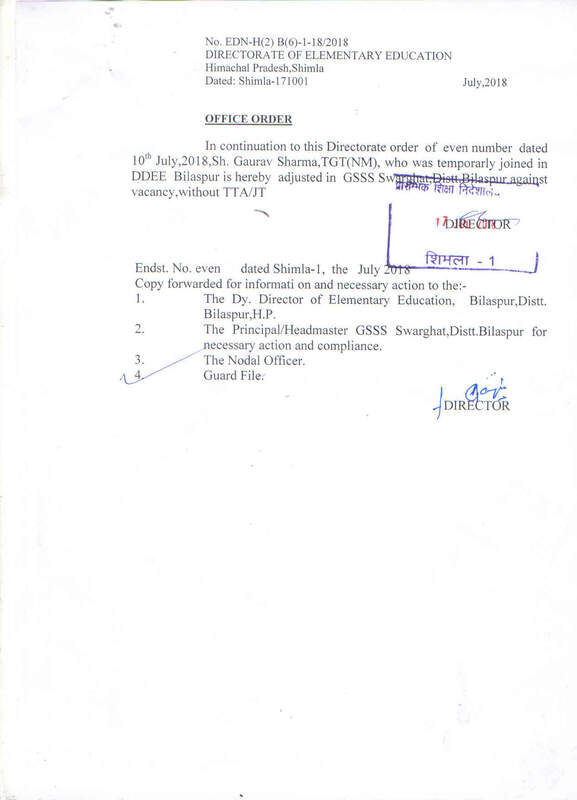 Renu Bala, TGT(A), from O/o Directorate of Elementary Education, Shimla-1 to O/O SPD, SSA, Shimla-1 against vacancy. 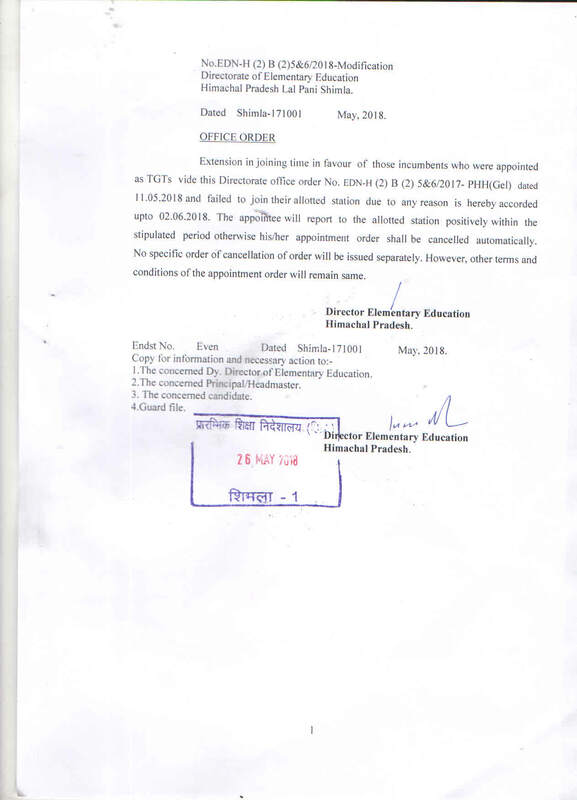 List for Counselling of ex-servicemen for the post of TGTs dated 28.05.2018 in the office of Directorate of Elementary Education, H.P. 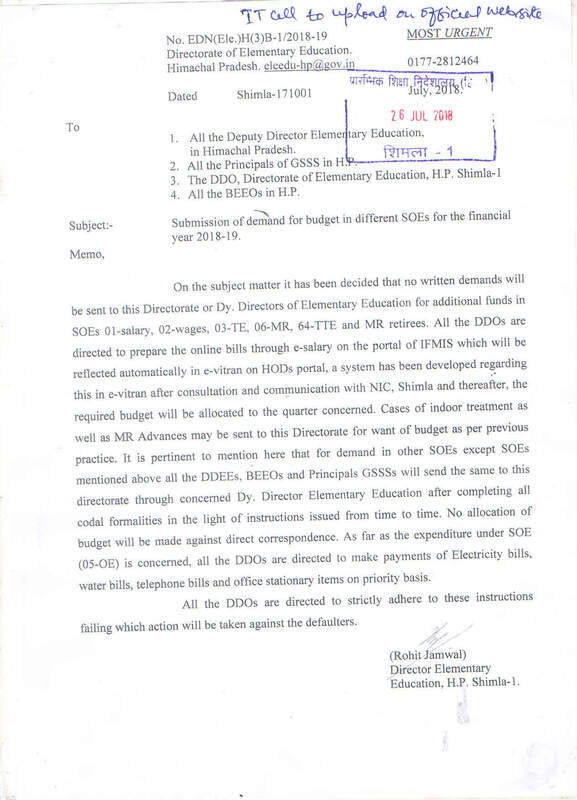 Corrigendum to read GMS Motla u/c GSSS Dhulara, District Chamba in respect of Sh. Mool Raj, TGT(NM)(Contract) basis. 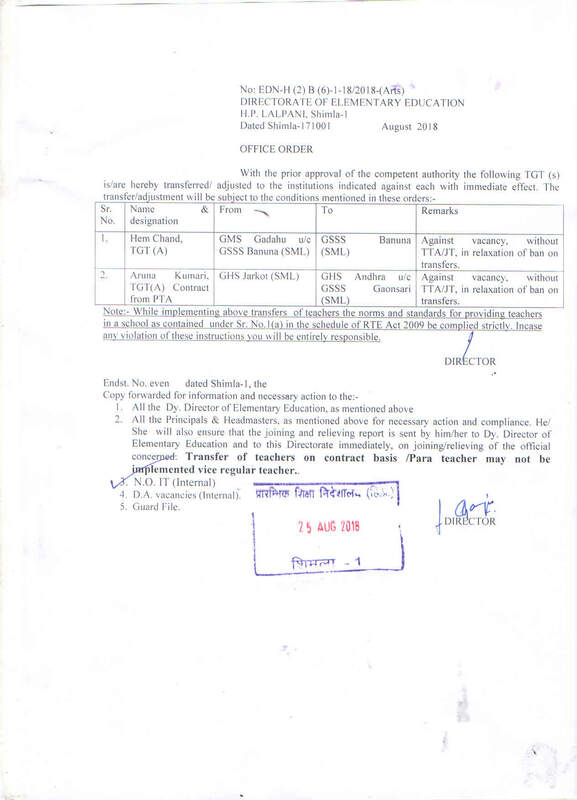 The appointment order of Junior Office Assistant (IT) purely on contract basis under Sports Quota. Corrigendum in respect of transfer order of Sh. Ashok Kumar, TGT(NM) from GSSS Darlaghat to GSSS Surajpur(Arki) District Solan at Sr. No. 7. Regarding 25% Reservation to weaker Sections and Disadvantaged groups in all the Educational Institutions Including privately managed School and public School. Regarding Certificate of Recognition- RTE Act, 2009. 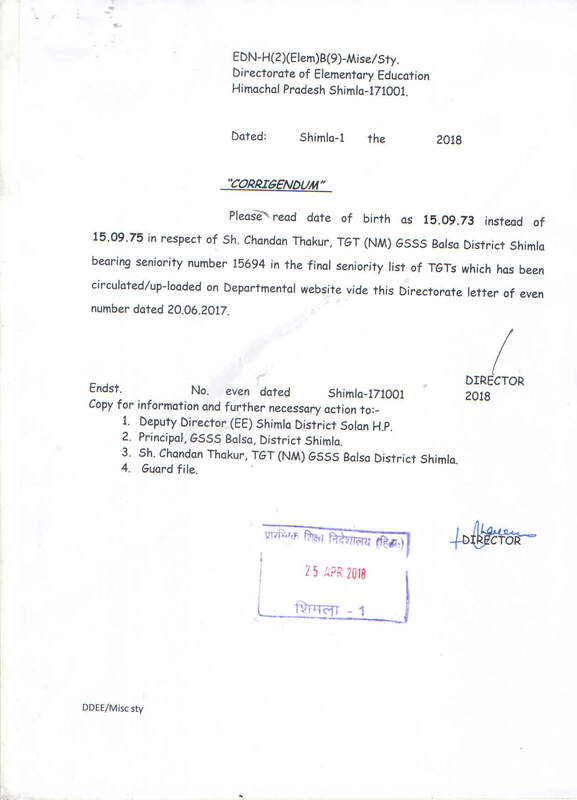 Regarding allotment of seniority number of Smt. Sapna Sood, TGT(NM) GSSS Luddu District Chamba. 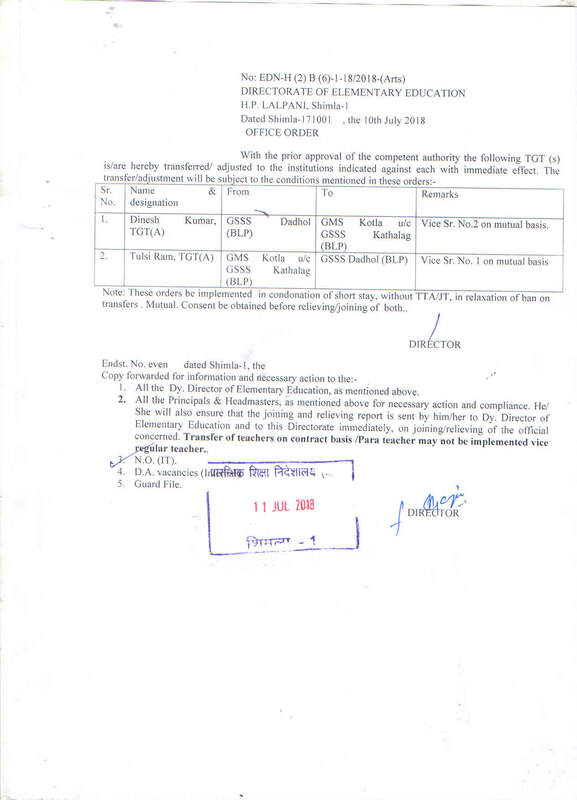 Adjustment order of Smt. Sarita Sharma , Lecturer Political Science u/t form DIET Mandi to GSSS, Triambli District Mandi at DIET Mandi. Corrigendum: to read GHS Mann Tareti u/c GSSS Jalari(Hmr) instead of GMS Mann Tareti u/c Jalari (Hmr.). Regarding mention category in the TGTs seniority list of Sh. Naresh Kumar, TGT(NM) GMS Katla u/c GSSS Dhundhan, district Solan. Programme implementation schedule of six month PDPET programme for the in-service teachers of the State of Himachal Pradesh. Corrigendum: in respect of transfer order of Sh. 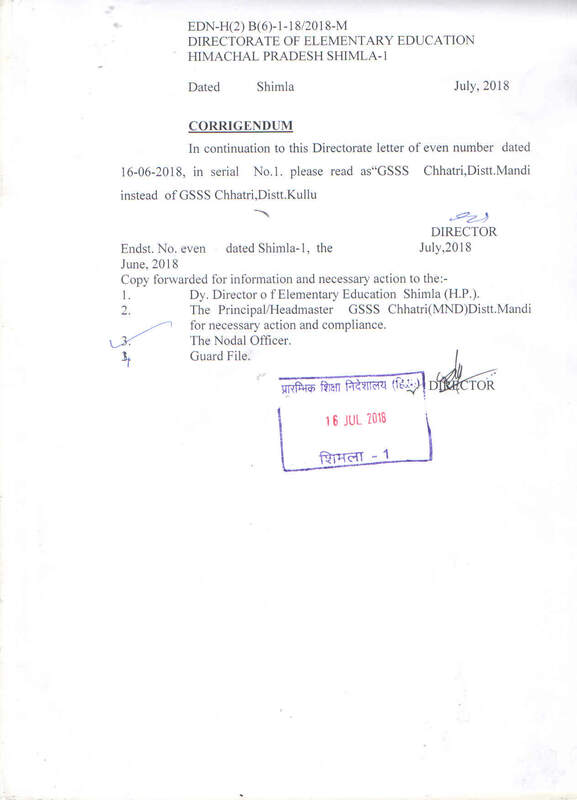 Rahul kumar, TGT(A) from GSSS Kothi Kohar(KGR) to GHS Chowki(KGR) against vacancy. 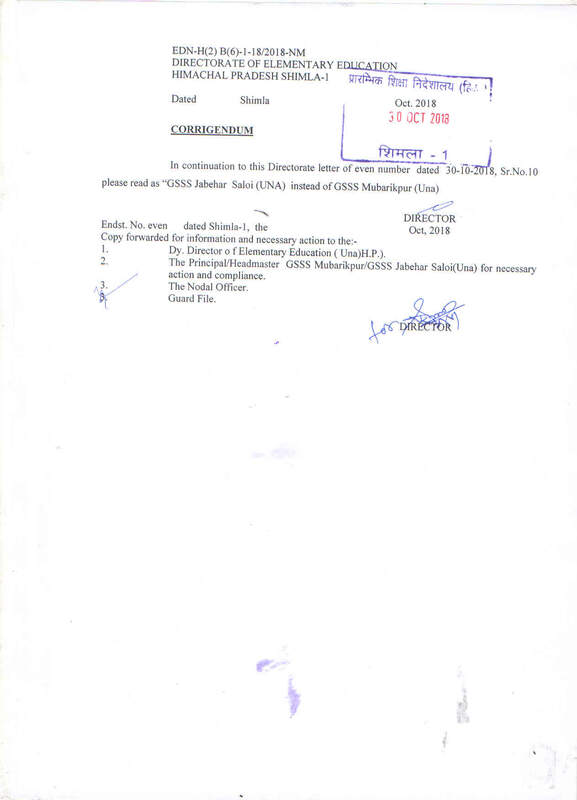 Corrigendum: to read GHS Malgan u/c GSSS Naina Tikker(Smr.) instead of GMS Malgan u/c GSSS Naina Tikker (Smr. 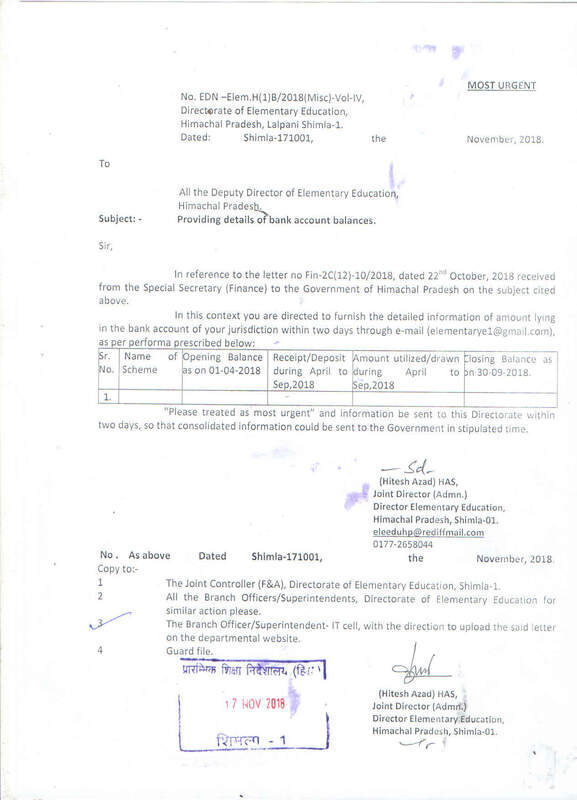 ), in continuation to the Directorate letter No. EDN-H(2)B(6)-1-18/2018-(Arts), dated 16.04.2018. Corrigendum in r/o Smt. Kusum Lata, TGT(A) from GMS Keet u/c GSSS(G) Theog (SML) to GHS Janoti u/c GSSS Dhamandri (SML) against vacancy, dated 11.04.2018. 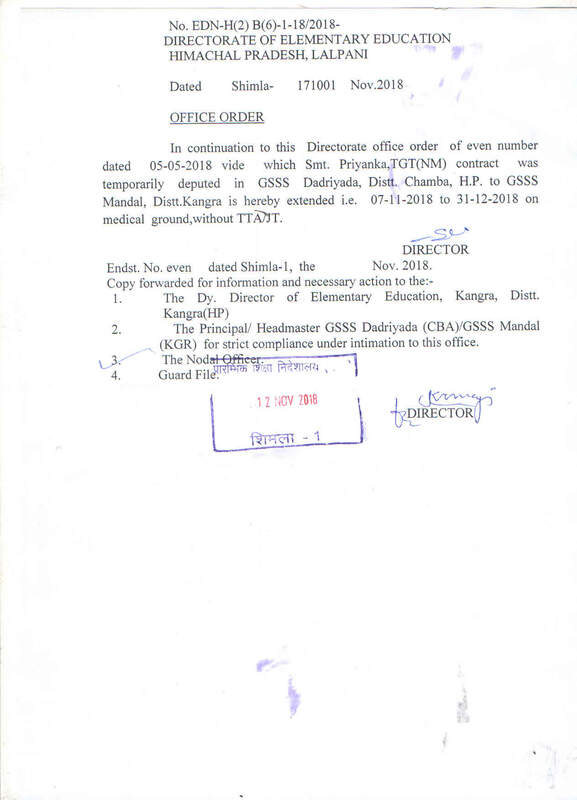 Corrigendum: to read GSSS Chandpur(Kangra) instead of GHS Chandpur(Kangra) in continuation of the Directorate letter No. EDN-H(2)B(6)-1-18/2018-NM. Proforma for supplementary textbook demand for summer-closing schools. 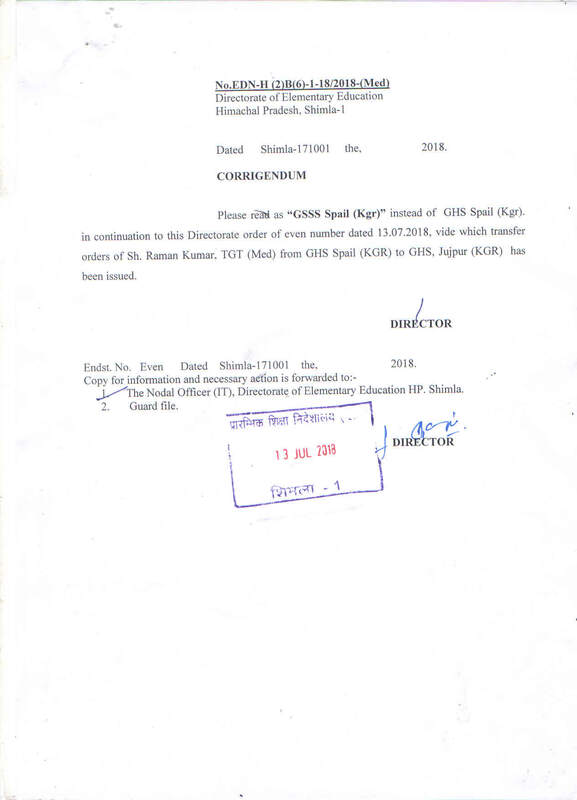 Corrigendum: to read GSSS Rakkar(Dehra) District Kangra instead of GSSS Rakkar (Kangra) in continuation of the Directorate letter No. EDN-H(2)B(6)-1/18/2018-medical. Final Seniority List in r/o TGT Med/NM/Arts selected through commission (2002) and appointed in the year 2008-,2009 and 2012 respectively as per order of Hon’ble High Court passed in CWP No. 1811/2008 dated 14-11-2011 and other connected matters and CWP No. 4273/2012-H and other connected matters dated 12.10.2012. 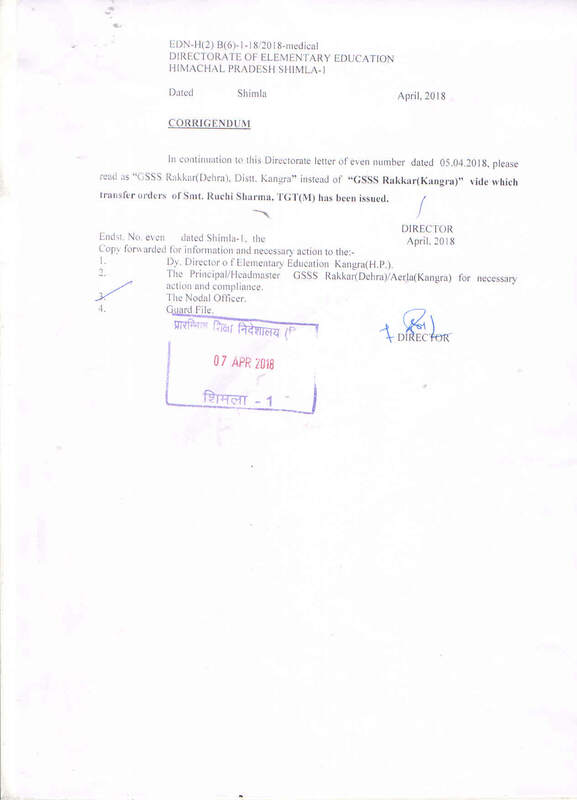 The office order in respect of tentative seniority list of TGT(NM/M) who were selected through HPSSSB (2002) and appointed in the year 2008 & 2009. Reference Requisition for the post of TGT (Arts, Non-Medical and Medical) only under Ward of Ex-servicemen category and TGT(Medical) under General, OBC, SC, ST category. Corrigendum: in respect of Smt. Sapna Devi D/o Sh. Dhiyan Chand appointed under sports quota. Transfer/adjustment order of TGT(NM) dated 02.03.2019. Transfer Order of TGT0Arts/Med) dated 07.12.2018. 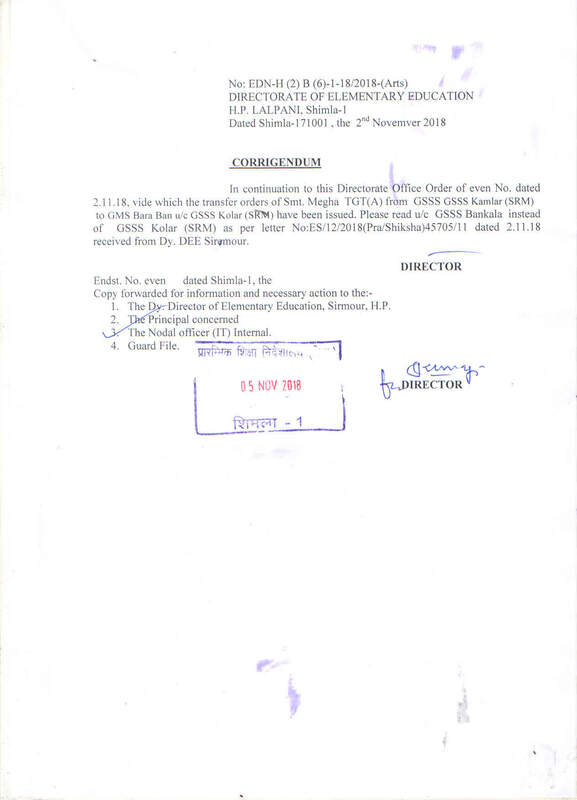 Transfer Order of TGT(NM/Arts) dated 27.11.2018. 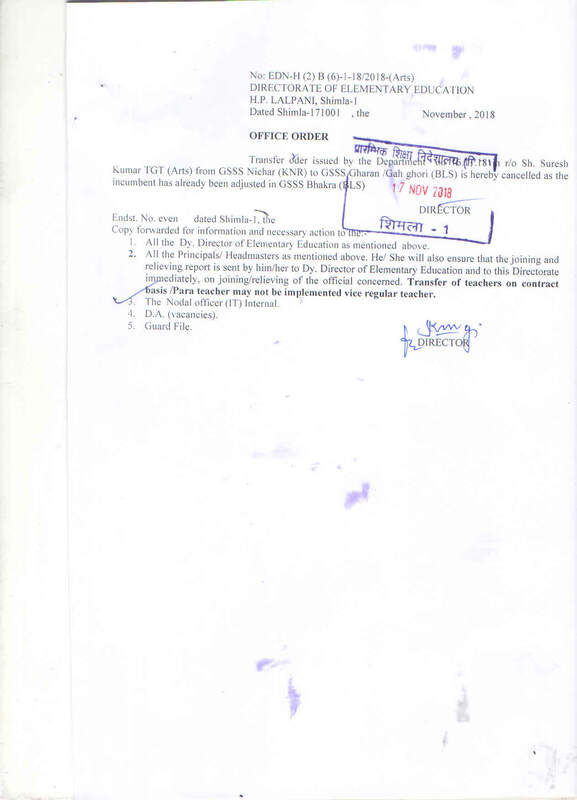 Transfer Order of TGT(NM/Arts) dated 26.11.2018. 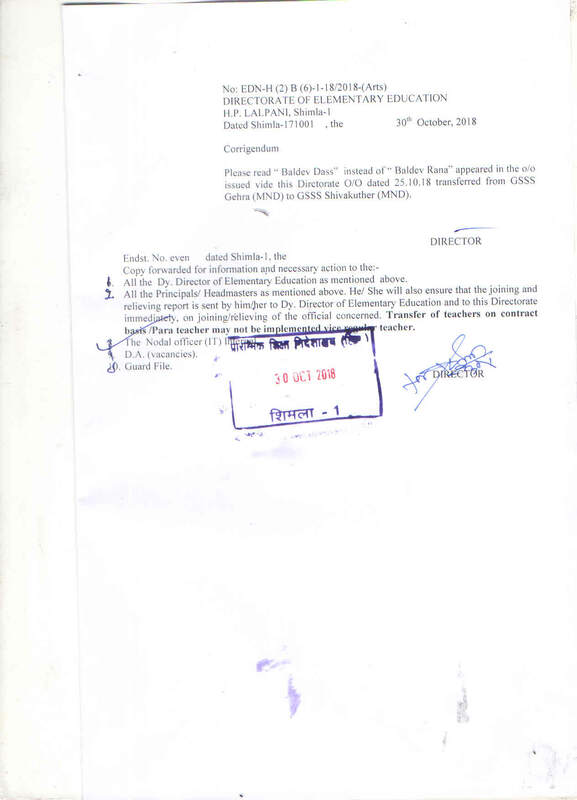 Transfer Order of TGT(Arts) dated 29.10.2018. 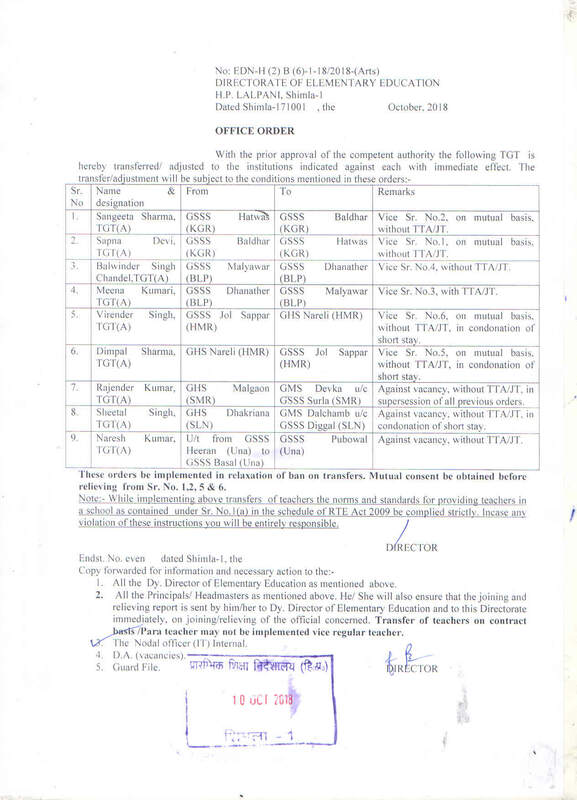 Transfer Order of TGT(Arts) dated 26.10.2018. 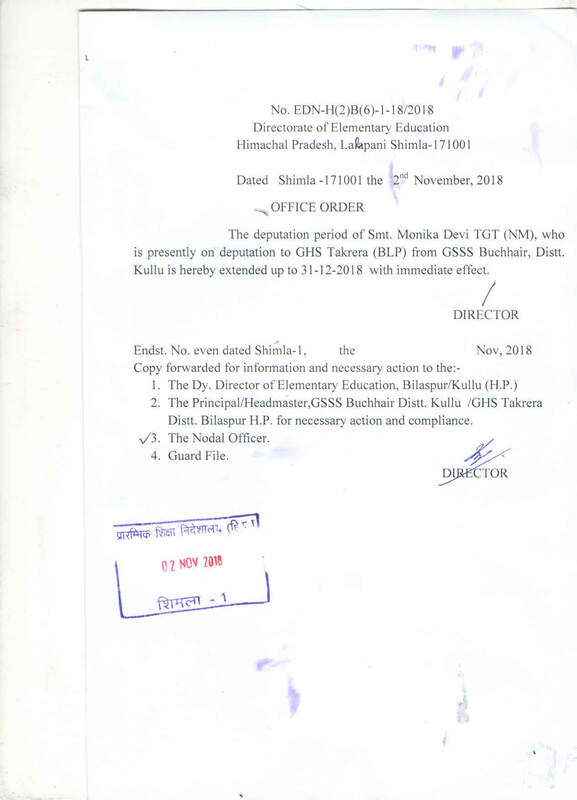 Transfer Order of TGT(Med & NM) dated 26.10.2018. Transfer Order of TGT(Arts) dated 20.10.2018.